The mana system in Magic has a lot of problems, the most glaring of which is the number of non-games that it produces. The advantage of those non-games is that you can, and should, build your deck in such a way that you minimize those, and your decisions on how to do that are a huge part of what makes Magic deck building interesting. It's why every deck just doesn't run a ton of four-plus-mana cards—you may not be able to play all those cards on time, or at all. If you want to cast your six- or seven-drops and overpower your opponent, you better have a plan for getting to turn seven or eight, where you have an okay chance of actually hitting that mana drop. You may need to run some cards that are weaker in the abstract in your deck so that you can get the maximum chance of getting to a later turn. The pressure the mana system puts on players to decide whether to pursue a deck that is powerful or consistent is a huge strength to Magic, and while it's possible that other methods could have worked to do this differently, I don't know any would do it in such a way that is as fun. 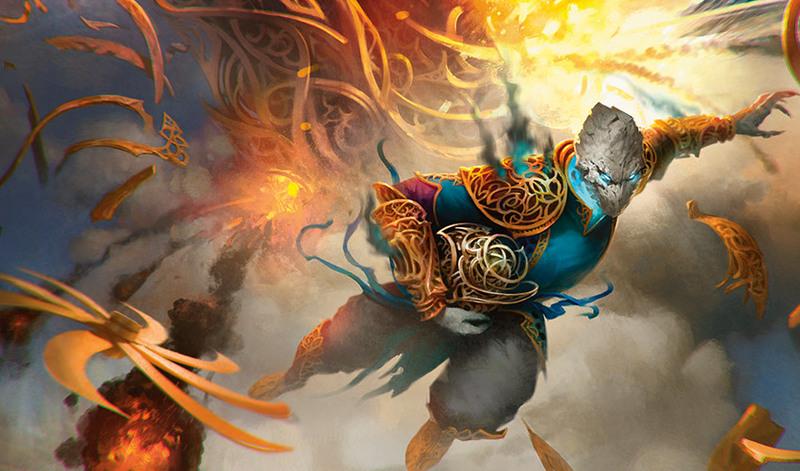 When you get down to it, power versus consistency might be the chief question that Magic deck building asks of players. I think this question is a huge part of why Magic has been so successful over the past 23 years, and so it's one that we keep working on. I personally find this dichotomy most interesting in Limited because it is something that you can't tweak after days or weeks of playing the deck over and over again. This question of power versus consistency is something that comes up again and again during drafts or while building a Sealed deck, so you are forced to figure out what your strategy is on the fly. What was the correct choice in the in your last draft may not be correct in this one. Today on Latest Developments, I want to talk about some of the interesting points in Limited that we use to bring up this question of power versus consistency. An important part of making Draft work and ensuring that the players involved have agency is creating interesting first picks in the draft. If all the rares are super bomb-y and easy to cast, then your colors are largely decided by which one you open in your first pack. At the same time, if all the rares are very weak, then it's possible that people spend too much time forcing the color with the best commons, and the format is more or less solved very quickly. We want there to be a mixture; even if the colors are not of exactly even strength, people can still be rewarded for going in an overall weaker color by the power of opening, or being passed, a strong rare. As a group, rares are stronger on average than the uncommons, and uncommons are stronger on average than the commons. You probably won't take a common first pick even half of the time (that helps to lead to a lot more diversity in drafts), but it isn't incorrect to do so. You aren't punished heavily for not having a good rare or uncommon in your first pack; that first pick can move you in one direction, but it can also be something unassuming that lets you instead keep your eyes open and get into whichever color is being under-drafted. There are a lot of interesting choices here. Exquisite Archangel is a bomb, for sure, but it costs a lot of mana. It's a very viable first pick, but you are signing yourself up for a deck that wants to get to the long game. Gifted Aetherborn is the next strongest in a vacuum, but double-black is a not an insubstantial cost. Even if you end up in a black deck, you may have real problems casting the card anywhere close to on-curve. While it is still very good on turn four or five, you miss a lot of its power if you can't cast it until much later in the game. Shock is the least exciting, but it's a versatile card that is usually quite good at any point in the game. Plus, if things go sideways a bit, you can always splash it into your deck. Also, you have left your strategy the most open; fast or slow, and no matter what your mana split is, if you are playing red, Shock will be strong. Ideally, getting options like this also helps if a player prefers one color or strategy. Different players value the raw power of this first pick much higher than the openness. Beyond just a personal preference, you also have other things to consider at the highest levels of play. Who else is sitting at your table, and what kind of record do you need? If you are at a table full of people who are stronger than you at Limited, you might want to push toward a deck that is more bomb-y and requires less interaction. If you think you can beat anyone at the table reliably as long as your deck isn't truly horrendous, you might take a safer pick to stay open longer and have a higher average deck quality. Record needed can also come in; there are plenty of times at Grand Prix especially where the difference between going 3-0 and 2-1 is substantial. If you need to 3-0 to make the Top 8, it may be correct to take a larger risk early in the draft to get a stronger deck. These kinds of decisions go a long way toward allowing depth in repeated drafts of a format and help to reward people who want to learn the format and the kinds of risks and rewards it offers in greater depth. The most well-known way to test the power-versus-consistency curve is to think about how many colors you want to play in a draft. Imagine a world where you got to play any spell you drafted without needing the specific color of mana; you would end up with the strongest black and red removal, the best blue and white fliers, and green fatties. You could play any bomb you opened. While you may not make all the synergy cards work, your average card quality would be off the charts. The reason Magic doesn't have perfect mana like this is to create an interesting choice between playing the strongest individual cards and having the most consistent mana base. While we push splashing heavily in multicolor-centric ("gold") sets, you can technically play a five-color deck in any format—you just need to draw the cards. You can put all the strongest cards into your deck, but you may die with them in your hands. The more colors you run, the less consistent your deck will be by the nature of the game. If you want maximum consistency, you can run a monocolor deck. While you may not draw the right number of lands, you will never draw the wrong combination of lands when playing a one-color deck. The problem is that your deck only has access to a small portion of the card pool, so you are going to have a hard time competing with your opponent's card quality. Two colors tends to be the optimal balance for most sets, giving you a huge swath of the card pool to select in the draft (especially if you manage to stay open long enough to figure out which colors are under-drafted). You are going to lose some games to drawing five lands of one color and getting stuck on one, or even zero, of the other, but your average number of games won peaks at two colors, then starts going down the more colors you add. While the average number of games you will win, in the abstract, tends to go down when you play more than two colors, that doesn't mean it is going to impact every draft the same. You may have such a high quality of cards in a third color that it is worth it, you may have incredibly strong mana fixing, or you could be in a situation where the draft went truly south and your best chance of pulling out any victories is to play the strongest cards available to you and hope your mana works out. In every set, we include some number of cards to help your mana. It could be as simple as the enters-the-battlefield-tapped lands, it could be your run-of-the-mill Evolving Wilds, or it could be something larger like a cycle of mana Obelisks. While these cards tend to be of pretty low quality in and of themselves, they increase the power of your deck, to a point, by increasing its consistency. While I don't think you would ever want to run eighteen ETB-tapped lands, very few two-color decks wouldn't benefit from having at least one or two. Similarly, if you have enough strong cards in three or four colors (maybe even that are three colors or more), you may take the hit on running a few weaker cards—like several Obelisks—to ensure you can cast the rest of your deck. There is also the hidden secret method of splashing: just play a slower deck. It turns out if you are running an aggressive deck and want the average game to last six turns, you will only see around fourteen cards in your deck. If you want to, instead, have a game go to turn eleven or twelve, you are seeing more like eighteen cards, or likely higher since you probably have some card draw or selection in your deck. Suddenly, playing a few cards of a third color is more likely to pay off. When drafting, or even when building, the decision of how many colors to run isn't always easy. The optimal number may change draft to draft, relating to your card pool and the series of cards you saw. Sometimes you are rewarded for ignoring the big and splashy cards, passing them down the line for a sleek deck that rarely stumbles, and sometimes you get rewarded for being in a third color by getting a few strong cards in the third pack. That it isn't the same in every draft rewards that decision-making process of figuring out what the optimal strategy is again and again. One of the things that separates the top drafters from those who are merely good is how they use their sideboard. A long time ago, it was hard in a draft to find 23 cards you were remotely happy running, but most people today end up getting to a point where they need to cut more than a few playable cards from their Draft deck. For that reason, it's often a good idea to take highly situational cards in the middle of packs rather than hoping to get them at a point where there is nothing left of value in the pack. Forsaking a very middling card that you would be unhappy to run, or your fourth four-drop in the middle of pack two, for a strong artifact- or enchantment-removal spell might be a good call. If you weren't going to run that card anyway, having something to sideboard in later during the draft may give you a higher average result. Sideboard cards mean a lot more than hate cards or silver bullets, though. By having a high enough number of playables, you can often get to a point where you are cutting fairly reasonable cards, and you also have access to those cards in your sideboard. That might sound obvious, but how often do you go through your sideboard and put in a 1U 1/3 against an aggressive deck, or bring in two Mind Rots against a deck that is trying to hit its seventh land? Having a higher number of playables removes some of the skill that used to exist when it was possible that by misreading signals you could end up with not nearly enough cards to play and replaces it with mindful decisions that are generally less impactful, but are more fun. We intentionally attempt to make even the weakest cards in Limited something you might sideboard in unless it is needed for Constructed for some reason. Even lowly cards like Commencement of Festivities can come in very helpful if playing against a deck with Overrun effects. Our best Limited formats are ones where every card has at least some situation in which you would board it in—even if it is just there to act as a speed bump for a much faster deck so that you can get to the late game. That's it for this week. Next week, I'll be starting the M-Files for Aether Revolt.